Aberdeenshire folksinger, Iona Fyfe, has become one of Scotland’s finest young ballad singers, rooted deeply in the singing traditions of North East of Scotland. 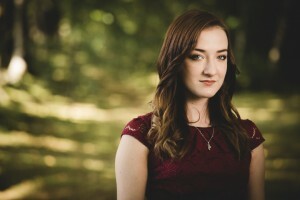 At nineteen years old, Iona has established a strong voicing of place in her repertoire and was a nominee for Scots Singer of the Year at the MG ALBA Scots Trad Music Awards. A finalist in the BBC Radio Scotland Young Traditional Musician of the Year 2017, Iona has been described as “one of the best that Scotland has to offer.” (Global-Music.de). “East”, her debut 6-track EP encapsulating North East folksong was received with great acclaim. Hailing from Huntly, Iona draws inspiration from source and revivalist singers and is a fine interpreter of traditional folksong in a contemporary yet sympathetic manner. Iona’s style spans into several folksong idioms and led her to win The Molloy Award at Birmingham Irish Trad Fest in 2017. Iona has competed in the BBC Radio 2 Young Folk Award and has performed at venues such as The Music Hall Aberdeen, Glasgow Royal Concert Hall, the Mitchell Theatre and most recently The Royal Albert Hall in London. With her band, Iona has performed at high profile festivals throughout the UK from Orkney Folk Festival to Sark Folk Festival and others such as Celtic Connections, Stonehaven Folk Festival and Folkest International Folk Festival in Italy. Iona is currently working on her debut album, which is set for release at Celtic Connections in 2018. Currently studying BMus Traditional Music at the Royal Conservatoire of Scotland, Iona has featured singing for Prunella Scales and Timothy West in the new Channel 4 series of Great Canal Journeys. Since performing at the Glasgow Barrowlands in 2014 alongside tradition bearers such as Sheila Stewart, Joe Aitken and Danny Couper for Aidan Moffat’s collaborative project “Where You’re Meant to Be”, Iona has been featured in BBC Scotland programme Landward.